Since 2000, The Democracy Collaborative has been working to dissolve our nation’s broadening economic gap by returning wealth to individuals, families, and community-based organizations. It has shown that, by restoring local banks, broadening ownership over capital, and refocusing public and private resources, we can end generational poverty and create high-quality jobs that will enable workers to support their families while stabilizing their communities and environments. This is Community Wealth Building. The Community Wealth Building field is comprised of a broad range of models and innovations that have been steadily building over the past 30 years or more – various forms of cooperatives, employee-owned companies, social enterprise, land trusts, municipal enterprise, community development financial institutions, community banks, and more. 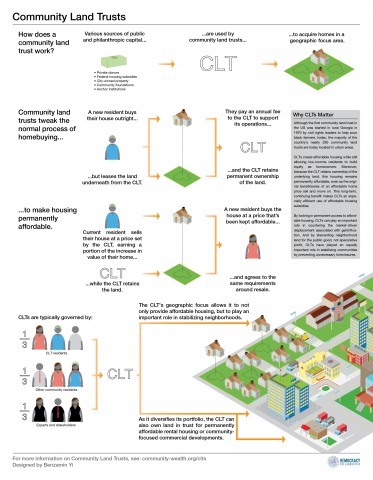 These structures and models are part of a growing ecosystem that aims at improving the ability of communities and individuals to: (1) increase asset ownership; (2) anchor jobs locally by broadening ownership over capital; (3) help achieve key environmental goals (including decreasing carbon emissions); (4) expand the provision of public services by strengthening the municipal tax base; and (5) ensure local economic stability. Such strategies are also designed to draw and keep dollars within the community: first by preventing local financial resources from “leaking out” of an area; and second by leveraging the use of procurement and investment from existing local “anchor institutions” such as hospitals, universities, foundations, cultural institutions, and city government for community-benefiting purposes. We believe that a unique opportunity now exists to dramatically advance the Community Wealth Building field over the next 5-10 years. This opportunity stems from a combination of negative and positive trends that are creating great possibility for change. Negative trends include a deepening distrust in financial institutions and large corporations, the ongoing fiscal crisis and the impact it is having on our core urban areas, and a stagnant economy that is seemingly incapable of creating high-quality jobs, protecting the middle class, or reversing the trend of increasing wealth inequality in our country. One the positive side of things, we see an increase in sustainable new approaches to the economy: Impact Investing, the “move your money,” movement, a renewed emphasis on “buy local” strategies and living local economies, innovative new corporate structures (such as B Corps), and promising shared-ownership models such as Cleveland’s Evergreen Cooperative Initiative. In this tension between old forms and new solutions, we see great potential for implementing and growing effective Community Wealth Building strategies. How do they work and why do they matter?